I already explained in a recent article how to force bulbs in a pot of growing media, but you can also force them with no soil at all, over a container of water. A “hyacinth vase” is typically used for this purpose. It’s a transparent or ceramic hourglass-shaped container designed to hold one bulb. The constriction at the vase’s neck is designed to support the base of the bulb and hold it above the water so it won’t sit in water and rot. Hyacinth vases have been around since at least the 18thcentury and are easy to find in garden center that sells bulbs as well as online. However, you don’t actually need a hyacinth vase. You can use any container with a neck the right size to hold the bulb suspended above water: for example, a small jam jar might work. I first experienced forcing a bulb in water in kindergarten. I was absolutely fascinated to see the plant grow from roots to bloom in such a short time. And this is something you can do with your children or grandchildren. Also, a bulb is big enough that a child manipulate it and put it in the vase. From about age six on, children are even mature enough to be able to water their sprouting bulb … under the watchful eye of a parent, of course, to remind them about regularly checking the water level. The bulb traditionally used for forcing over water is the hyacinth (Hyacinthus orientalis). Garden centers sell them from September until near Christmas. Any bulb about the size of a hyacinth bulb could also be used instead, such as a large tulip or narcissus bulb. Smaller bulbs, like crocus, squills and muscaris, would just fall right through the throat of a hyacinth vase, but if you look, you can find “crocus vases” online that are adapted to smaller bulbs. Plus there are lots of bottles with a constricted throat of an appropriate size. You can even grow an amaryllis (Hippeastrum) bulb over water … provided you find a container with a large enough mouth. And yes, there are amaryllis vases to be found online! The best bulb for a hyacinth vase is, of course, a hyacinth, but not just any hyacinth: a prepared hyacinth. They come in all the usual hyacinth colors and are just as deliciously perfumed, but have been, as the name suggest, pretreated by gradual cooling so that they have already undergone the “cool winter” needed to encourage bloom. As a result, they don’t absolutely need a chilling period (although cool temperatures—about 50 to 54 ° F (10 to 12 ° C)—are still best). Nor do they really need to be stuck in a dark corner: you can just put them on a window ledge and let them do their thing! And a prepared hyacinths blooms quite quickly: in as little as 6 weeks, although 9 is more likely. The Paperwhite narcissus (Narcissus papyraceus and its close relatives, such as ‘Grand Soleil d’Or’ and Chinese Sacred Lily) are the best narcissus to use for growing indoors over water, as they don’t require a true chilling period either. They will take normal room temperatures, although night temperatures below 65 ° F (18 °C) are best, and bloom in 5 to 8 weeks. And finally, there is the amaryllis (Hippeastrum) that needs no cold or dark treatment at all, just a really big vase, coming into bloom in only 5 to 8 weeks. But forcing amaryllis over water is expensive: they’re not cheap bulbs and forced bulbs bloom only once. I prefer to grow amaryllis bulbs in soil so they can be treated not as throw-aways but as true, long-lived houseplants. The technique is incredibly easy. Fill the container with fresh water up to the neck and place the bulb, pointed side up, just inside the container, where the neck narrows. The base of the bulb should barely touch the water. Then set the container a cool, dark place. Roots form quickly and reach down into the water. You can let the water level drop considerably once roots are present: they don’t have to be entirely in water, just at least dip into water. Still, take a look every three or four days, adding more water as needed, as bulbs are thirsty creatures and the container should never dry out completely. When a healthy sprout has formed, the container is filled with roots and the minimum number of weeks has elapsed, the plant can be exposed to light and heat. Flowering then occurs quickly: often starting in barely a week. When the bulb stops blooming, clean the container and put it away for next year, then drop the bulb into the compost. Being grown over water will have completely exhausted it and it won’t bloom again. Don’t even think of adding fertilizer to the water to “feed” the bulb for another flowering: it will be in no better shape … and your container will quickly fill with algae. You can also easily force bulbs in pebbles or any other fairly inert substrate, such as gravel, clay hydroculture pebbles, seashells, marbles, etc. This is, in fact, still considered forcing over water, as the substrate provides only holds the plant up: it’s the water that makes it grow. Any decorative container with no drainage hole will do, although a transparent container will make your life easier, because you’ll not be able to see the roots growing (fascinating) and also better monitor the water level. Just drop substrate into the bottom of the container to a depth of anywhere from an inch (2.5 cm) to 5 inches (13 cm) or more. Roots will grow into this layer. Set the bulbs on the substrate. For the most beautiful flowering, fit as many bulbs into the container as it can hold and, although you’ll read otherwise elsewhere, yes, the bulbs can touch! For added solidity, fill the interstices between the bulbs with more substrate, leaving on the tip of the bulbs exposed. Now add water up to the base of the bulbs and place the container somewhere cold and dark. Soon roots will form and the forcing is underway! All that’s left is to check every now and then, topping up with water as needed, then bring the pots into the light and warmth when the bulbs are ready (see above). All bulbs suitable for forcing over water are also suitable for pebble forcing, but the Paperwhite narcissus is the most popular for this use. There you go! A simple little fall project that will bring gorgeous (and often scented) bloom into your home or office during the dark days of winter and early spring. Why hesitate? Just do it! What can you do with the fall bulbs you forgot to plant? So, you bought a few packs of spring-flowering bulbs (tulips, daffodils, crocuses, hyacinths, etc.) last fall, intending to plant them right away. Except it’s now winter and it’s apparently too late to plant them, what with the ground is frozen or covered with snow. It looks like you missed the boat. So, can you keep bulbs over the winter and plant them in the garden next spring? The most logical thing to do with fall bulbs is still to plant them outdoors, even though it’s later than normal. If the soil is not yet frozen (that will depend on your local climate), there is no problem in planting tulip bulbs, narcissus, crocus, etc. as late as December or even January. So what if the ground is covered with snow? Just brush the snow aside and dig a hole. If there is snow on the ground, sometimes you can just brush it away before planting and still dig. If the ground is frozen, but only on the surface, it’s easy enough to break through the frozen crust thus formed. Then just plant as you usually would, digging a hole three times deeper than the bulb is high (for tulips, a depth of 1 foot/30 cm is preferable) in rich, well-drained soil somewhere that receives spring sun. There is even an advantage to planting a bit late: often the surface soil refreezes quickly after planting, keeping the bulbs safe from squirrels. With no-dig planting, just dump packaged soil over the bulbs and let Mother Nature do the rest! If crunching through a crust of frozen soil is not your idea of easy gardening, here’s an equally effective, but faster method. First remove the snow, if there is any, then set the bulbs on the ground. Now, here’s the neat part: you don’t really have to dig a hole at all. 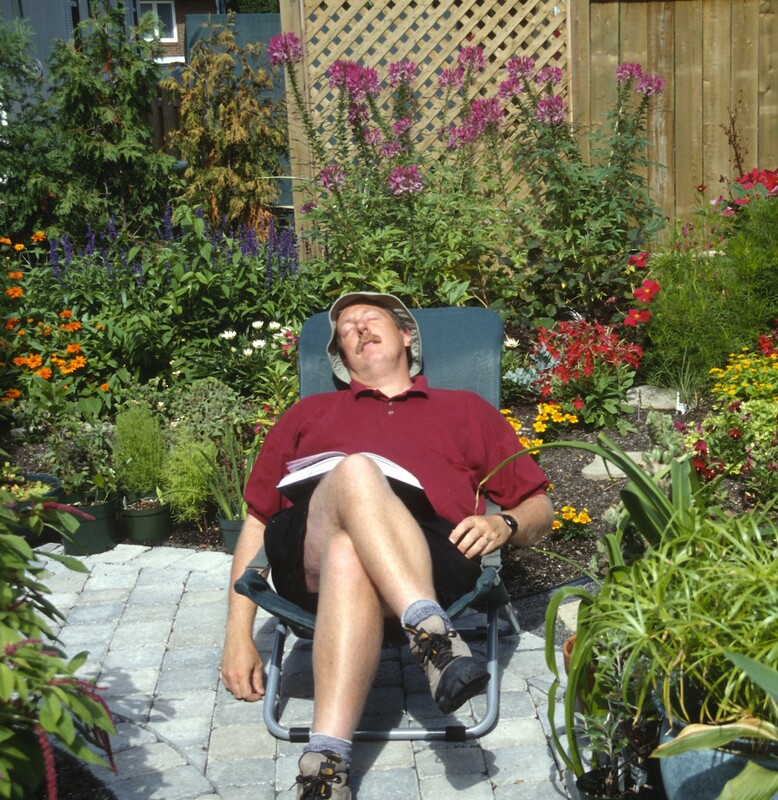 Just cover them with a bag or two of garden soil or potting soil. Again, strive for a depth three times the height of the bulb. The warmth of the fresh soil will thaw the ground below, allowing the bulbs to root well… and they’ll be buried deeply enough that they won’t freeze until they’ve rooted in, which is what you want. I’ve used the “no-dig planting” method during a January thaw and had great success. This is the ideal method for planting bulbs where there is root competition too, such as in a wooded spot, even when the soil isn’t frozen. The two previous methods only succeed when the soil is not frozen or only frozen on the surface. If the ground is frozen so deeply that a shovel can’t penetrate it, then it really is too late to plant your bulbs outside this season. But there are still other possibilities. 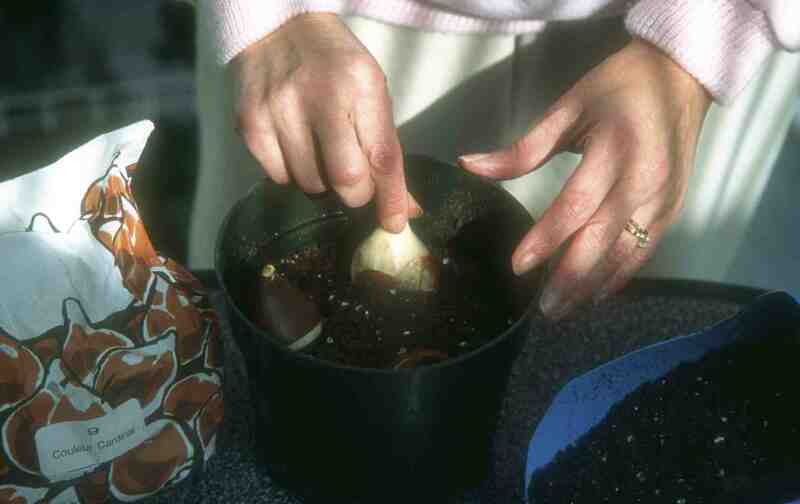 Forcing bulbs is easy: just pot up your bulbs and keep them moist and cool. You can also force bulbs indoors for spring bloom in pots and in fact, this is the most logical solution to apply when the ground is thoroughly frozen. Just pot them up and water well. Seal the pot inside a plastic bag (to prevent evaporation, as you’ll want the roots to remain moist at all times) and place it in a refrigerator, a heated garage or a cold room. It takes about 13 to 14 weeks (three and a half months) of cold for the bulbs to get ready to bloom (a bit less for hyacinths), then in late March or early April, set the potted bulbs on a bright windowsill… and fill your home with blooms! Forced bulbs just starting to bloom on a windowsill. You will find more information about forcing in the article Forcing Bulbs without Twisting Arms. It is also possible to store the bulbs dry in a cold spot over the winter, thus giving them the cold period they require for blooming… before you plant them. This technique is called “pre-chilling” and is commonly used to make tulips, hyacinths, narcissus, crocus, etc. flower in regions where they normally wouldn’t bloom because the winter isn’t cold enough for them (spring bulbs are cold climate plants: without a cold winter, they won’t flower). If you see tulips or hyacinths blooming at Disneyworld, on the French Riviera or in Australia, their bulbs were probably pre-chilled. Store your bulbs cool but well-aerated. For pre-chilling, store your bulbs bare (i.e. unplanted) in the refrigerator, a barely heated garage or in a cold room over the winter. The temperature should remain between 34˚ and 40˚F (1˚ and 5˚C) at all times. They can be stored loose in an open box or container or placed in a mesh bag, a paper bag or a nylon stocking, but never inside a plastic bag (under plastic, there is too much risk of condensation and during pre-chilling the bulbs must remain dry). So, to resume the situation: the very best way to ensure that spring-flowering bulbs bloom beautifully not only the following spring but also perennialize well still remains planting them outdoors in the autumn according to the traditional method. But at least you now know what to do if you miss that opportunity! Forcing bulbs such as hyacinths, crocus, tulips, and narcissus is not rocket science: just the pot them up in the fall, barely covering the bulb with potting soil (in fact, if the tip of the bulb still shows, that’s not a problem), then water well and seal the pot in a plastic bag, putting it in a cool but frost free place, such as a fridge, a barely heated garage or a cold room. You want cold conditions, but above freezing. Check the condition of the bulbs occasionally, watering if necessary, because bulbs, unlike other plants, actually grow and use water when stored in the cold and dark! When the bulbs are ready to bloom, remove the bag, place the pot in a well lit location, water it as needed and your bulbs will be in bloom in as little as two weeks! Forcing bulbs takes more time than people imagine, though. Even if the bulb looks “ready”, with a well-developed shoot and many roots, it needs to have been in cold conditions for the equivalent of a winter. For most bulbs, figure 14 weeks of forcing before it is time to expose them to heat. Hyacinths are the fastest bulbs to force, usually requiring only 8 or 9 weeks of cold… at least, they’re the fastest among traditional bulbs. There is a subcategory of narcissus, the Paperwhite narcissus (Narcissus papyraceus), that comes from a Mediterranean climate where it never gets very cold. This narcissus is not hardy in many areas (USDA zones 8 to 11) and is generally sold as an indoor plant. Just pot up Paperwhite bulbs, water them and they will be in bloom in time for Christmas!